Want to get involved? VT are a volunteer organization and we can’t do it without people like you! 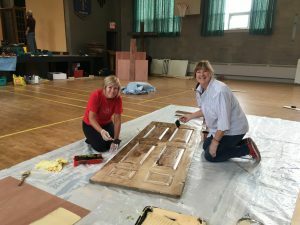 VT require enthusiastic volunteers for everything from Box Office, ushering, building and painting sets, lighting, sound technicians, costumes, make-up artists, stage managers. Interested in being more involved? VT Executive need new members! To learn about our Volunteer positions click here. Members may attend opening night performances at half price at Village Theatre, and also at other area amateur theatres, Theatre Burlington, Hamilton Theatre Inc., Binbrook Little Theatre and The Aldershot Players. (See below for more details). You must ask for this discount when ordering your tickets, and be prepared to show your membership card at the door when entering. If you regularly attend local theatre, this saving can quickly pay for your membership! All members are insured for injury while working at Memorial Hall, the performance home of Village Theatre Waterdown. Best of all, you’ll be encouraged to become an active part of the most exciting and friendly amateur theatre group in the entire universe! Membership Fees are only $5.00 per year! BE A PART OF THE PRODUCTION for the 2018/2019 SEASON! These theatres offer various discounts for card carrying members of any participating group. Please request special members’ pricing when ordering tickets, and reserve early as opening nights usually sell out. The Aldershot Players – discount for Thursday night performance only. Not dinner theatre events.